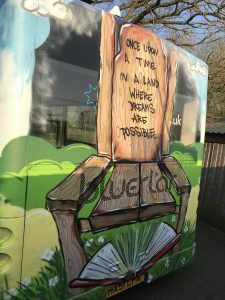 A lick of paint has transformed a community bus in Southwick thanks to a talented funeral co-ordinator. 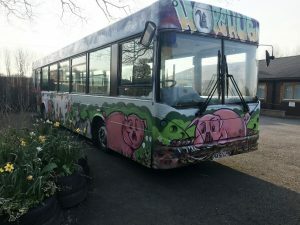 Answering an animal call for help, Thomas Parfitt from The Co-operative Funeralcare in Frome spent five days transforming the bus at Hope Nature Centre in Southwick. 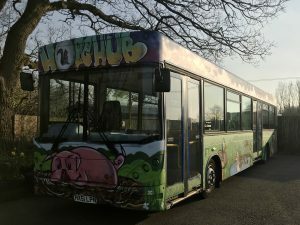 The bus, which had been generously donated by the More Bus Group, is now adorned with animals of all shapes and sizes and will be used at the centre as part of its work to train people with learning disabilities in animal care and catering skills. The bus will be converted into a venue for school groups and birthday parties and an events space for the nature centre and its customers. Thomas said: “One of my colleagues knew about my passion and forwarded me the appeal for an artist. The funeral home where I work is part of a regional co-operative, Southern Co-op, which has a whole programme dedicated to supporting local communities so it wasn’t hard to persuade my colleagues to donate £300 for the materials and paint. “As soon as I got the green light, on my days off, I started painting. I used all the animals that are in the farm as references and popped a cartoon twist on them. It’s all painted using spray paints – no brushes or pens. The added space is expected to have a huge impact on the local schools and communities, and a programme of events and activities planned for 2019. Director of HR at Hope Nature Centre, Clair Beaty-Pownall, said: “We were incredibly grateful for the donation of the bus to Hope Nature Centre and we are delighted that it has been completely transformed.